This week we move one step closer to the start of the battle in February by looking at the German preparations for their attack. First we will talk about one of the most important features of the fighting, which was the masses of German artillery that would be utilized in the opening attacks. Then we will take our discussion of plans down another level of detail to look at how the Corps of the Fifth Army were arranged around Verdun and what orders were given to the infantry that would be executing the attack. Then we will dive into some specific preparations happening on the ground that were unique to the attack at Verdun. The German troops then had to suffer through weeks of waiting for the weather to be right for the attack, which was a painful and slow process given the winter weather that blew through the region in early February 1916. We will close out the episodes by going on a pretty lengthy side track that comes to you courtesy of the book Ring of Steel by Alexander Watson on the German and Austrian armies in 1916 that I think is super interesting and might be important information to have when evaluating the actions in 1916 as a whole. So I have decided to throw it into the end of this episode since it sort of fits and we are going to be really busy in the upcoming episodes. 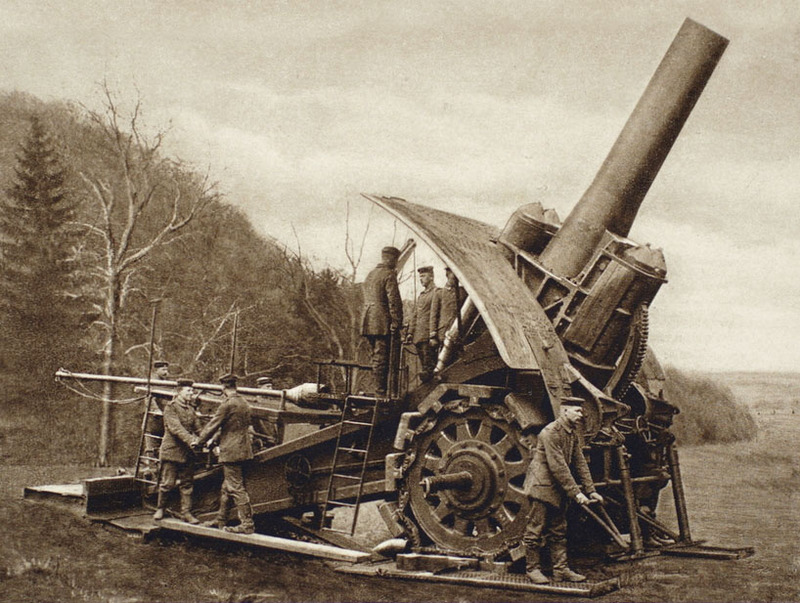 German 420 mm gun, although probably not a photo taken at Verdun it gives a good idea of the size of the gun. French, David. 1988. “The Meaning of Attrition, 1914-1916”. The English Historical Review 103 (407). Oxford University Press: 385–405. http://www.jstor.org/stable/571187. Last episode we discussed the process that lead to the details plans for Verdun passing from the German Fifth Army to Falkenhayn, where they were approved. This week we move one step closer to the start of the battle in February by looking at the German preparations for their attack. First we will talk about one of the most important features of the fighting, which was the masses of German artillery that would be utilized in the opening attacks. Then we will take our discussion of plans down another level of detail to look at how the Corps of the Fifth Army were arranged around Verdun and what orders were given to the infantry that would be executing the attack. Then we will dive into some specific preparations happening on the ground that were unique to the attack at Verdun. The German troops then had to suffer through weeks of waiting for the weather to be right for the attack, which was a painful and slow process given the winter weather that blew through the region in early February 1916. We will close out the episodes by going on a pretty lengthy side track that comes to you courtesy of the book Ring of Steel by Alexander Watson on the German and Austrian armies in 1916 that I think is super interesting and might be important information to have when evaluating the actions in 1916 as a whole. So I have decided to throw it into the end of this episode since it sort of fits and we are going to be really busy in the upcoming episodes. In his book Verdun: The Longest Battle Paul Jankowski gives this, probably apocryphal, account of an exchange between some German artillery officers and an infantry captain "Gentlemen, there will be no offensive for you, only a promenade." This is truly what many of the German leaders believed, that with the artillery as the centerpiece of all of the preparations the guns would blast a hole through the French lines that the infantry would simply have to occupy. It was only in this way that the Germans could keep their casualties down while also inflicting as much pain as possible on the French opposite of them. The hope was that the French reinforcements, who would certainly arrive in great force once the offensive got going, would also be chewed up in the same way as the troops that were in the area to begin with. To accomplish these lofty goals the artillery, all of it, was put under the control of the staff of the 5th army instead of being under the command of the individual Corps and Divisions. The staff of the Fifth army then split the guns into groups that were each given a specific task. These tasks and guns were given to artillery commanders who then were able to decide how best to get the job done. Every type of gun had a specific purpose during the opening bombardment, and then during and after the infantry attack. For example the lighter guns, after providing their last barrages to the enemy would move up as soon as possible after the infantry went forward, the heavy guns to the rear would up their fire rate to make up for the lack of light fire. Once the light guns were established in new positions closer to the front, the heavy guns would then move up, with the light guns taking up the slack. Or at least that was the theory. Moving the guns was no small task, especially the larger howitzers. Because of the effort required all possible preparations were done before hand, specifically around preparing secondary positions for the artillery. This positions were prepared by first selecting them, then clearing and leveling the ground, pouring a concrete base if necessary, and then bringing up enough ammunition to keep the gun firing while the supply train caught up. Most importantly, these areas were camouflaged as well, if natural cover was not present then camouflage netting was put in place to hide the guns from French observers. The infantry also had orders to find and secure possible artillery positions as they advanced. To accomplish both this task and more importantly to keep the link between the advancing infantry and the guns intact there would be artillery observers sent forward with the infantry with telephone cables, which were often cut, but also signal flares and signal balloons. These last two forms of communication could either call in or halt the fire of the artillery behind. One extremely important piece of the preparations had nothing to do with the infantry, or the artillery planning, or the ammunition but instead was the construction of several large repair depots behind the lines for the artillery. There would end up being five of these large depots behind the front to take care of the guns. Damage to the guns came in two forms, the first being damage suffered from enemy fire, which could hopefully be kept to a minimum. There was also the standard wear and tear experienced after firing hundreds and hundreds of rounds. Remember these guns have an explosion going off inside of them time and time again which caused wear on the barrel which could have devastating results. Generally an artillery shell, or a rifle bullet in a gun, fits pretty snug in the barrel on its way out. This prevents the explosive gas from escaping during the firing process which is important to give the shell its maximum, and more critically, predictable range. As the barrel wears out and the shell fits looser and looser more and more gas escapes and the shells start oscillating much more during flight, even getting to the point where they might start tumbling which could be disastrous. This might mean that the shell would go to the left or right of the target, or catastrophically fall short and onto friendly troops. Judging by the first hand accounts that I have read, nothing seems to be worse for morale than having your own fire fall onto you. This was a problem that the Germans would keep under control early in the campaign but as the year wore on and resources began to be allocated to other fronts it would become and increasing problem and concern for the German infantry. The plan for the German barrage was to cover a wide area before the attack, this of course included all of the front lines but also as far back the bridges over the river Meuse and some of the supply routes into Verdun. There was a special emphasis put into neutralizing the French artillery. To accomplish this important task special batteries of 150mm howitzers were provided with gas shells that would be fired on the known French artillery positions right before the attack. It was hoped that a good dose of gas on the unprepared French artillery men would silence their guns, at least momentarily. When they were not performing this mission the 150s, with their long range and precision, would be targeting specific supply routes behind the front. To feed all of the artillery arranged around Verdun required a huge amount of work and a constant flow of ammunition to feed the guns. This meant that new rail lines had to be built and ammunition dumps created and built up. 10 new rail lines were built up to the front just to handle the movement of supplies, this being on top of the already very developed set of lines that had made the attractive to Falkenhayn to begin with. For the duration of the opening weeks of the battle 2.5 million shells were kept near the front is huge artillery dumps or at the gun positions themselves. This is a pretty big number, mind numbingly big really, 2.5 million, this was only a 6 day supply. Before the attack even got started over 200 trainloads of munitions had been brought onto the scenes and after the first shots were fired 33 trains would arrive in the area every single day to keep the guns firing. That is 33 trains just for the artillery. That does not count the thousands and thousands of pounds of other materials that had to be brought in to keep the rest of the 5th army fighting, thousands of rations, rifle bullets, grenades, sandbags, everything to keep an army in the field had to be brought in by train. In the two months leading up to the battle, or at least when the battle was scheduled to start over 1000 trainloads of supplies were brought in. So, those 2.5 million rounds of artillery ammunition on 200 trainloads was just a fifth of the total supplies needed to even get the action started. With all of this artillery ammunition in the area a logical question would be what on earth, and how many of them, did the Germans have to fire it all. Well, they had a lot of artillery, like a lot a lot. To start with there were a total of over 1200 guns, but this does not tell the whole story. Some of these guns were truly massive. There were of course a large number of the smaller guns, the 110mm and 150mm and 210mm howitzers that were stationed closer to the front and made to be mobile. But there were also 11 30.5 centimeter and 14 of the 42 centimeter guns, similar to the ones that had been used in Belgium at the start of the war. For those listeners accustomed to the Imperial system of weights and measures, a foot is 30 centimeters, so all 25 of those guns fired a shell larger than that. There were also 3 of the newest of the massive guns in the German arsenal, these were the 38 centimeter guns that were fresh from the factory, one of these was called Big Max and in his book Verdun The Lost History John Mosier describes how the gun was setup and prepared for battle "The gun itself was mounted on a circular concrete platform about 20 meters in diameter and five meters deep, enabling it to have a wide angle of fire horizontally. "Big Max,” as it was known, fired a 750-kilogram shell containing 183 kilograms of explosive over a range of 35 kilometers was finally abandoned in October 1918." To get this many of the best guns in the German army in one place all the other armies on the front had to be robbed from, often having their newest and best guns replaced by older less efficient models, or even captured enemy artillery. So when the time came for the firing to start, these guns would be the ones using all of the ammunition. But of course, even with all of this fire the artillery could not actually capture any territory by themselves, that was up to the infantry. For this purpose there were 4 corps that would take part in the initial fighting, the 3rd, 7th, 15th and 17th. In January the staff of the 5th army started detailed planning for the attack and the first thing that they did was slice up the front into 4 pieces and assign one corps to each. Then goals were assigned out the each Corps, which would then assign goals to each division and so on and so forth down the line. All along this chain of orders emphasis was placed on keeping German casualties low. However, in the orders from the 5th army there was also the stated goal of keeping up the pressure on the French to keep them from being able to reconsolidate their position once the advance got rolling. These two facts, keeping casualties low, but keeping the attack going, seemed at odds with many of the commanders within the 5th army. What should be given priority? There would inevitably be instances were commanders were asked to choose between X number of casualties balanced against further attacks. Even after clarification was requested the original orders stood as written, and each Corps would act on them a little differently. This would create a situation where each Corps would not behave the same on the day of the attack, some of them would attack in a cautious way designed to minimize casualties, like Falkenhayn intended, while others would attack aggressively while trying to capture ground quickly, which cost more men but was in line with the army's orders. While it is almost inevitable that different commanders will act differently based on the same set of orders, this is what makes some commanders great and some really crappy, in this case it would cause a big problem for some of the French units, especially once Falkenhayn started refusing to send more troops into the area. The units that had exhausted themselves in their attacks, often in the most critical areas, were not given reinforcements needed to continue on the attack immediately, when they were most likely to accomplish this goal. Which would inevitably cause the attack to bog down against French resistance. So in this way the difference of opinions between the Crown Prince and Falkenhayn managed to filter down the chain of command to the Corps and Divisions of the 5th Army. But the attack was still planned to begin on February 12th, that is one thing that everybody agreed on, but then the weather got bad, really bad. The waiting would be really tough on the German troops. During the preparation for the attack the Germans had built a great number of Stollen, or underground galleries. These had been designed to give the attacking troops a place to stay, that was protected from all French artillery, in the days leading up to the attack. The Stollen were very well protected, and some were large enough to hold half a battalion of men. When the time came for the attack the men would move out of their stollen, up through the trenches, and then out to the attack. Originally the attack was supposed to start on the 12th, and on the 11th the Crown Prince even prepared his message to the troops for the next day "After a long period of stubborn defence, the orders of his majesty, our Emperor and king, call us to the attack!" But when the next day came, so too did heavy, heavy snow, cutting visibility drastically. For the German plan, predicated on artillery, then meant that the attack had to be delayed. The Germans required good visibility for artillery spotters, observation balloons, and pilots above the battlefield, it was felt that without these three things it would be impossible for the artillery to be effective. And so, the attack was delayed for 24 hours…and then it was delayed day after day for the next 10 days. During this massive delay the German troops, in their Stollen experienced a kind of hell. These shelters had been designed, provisioned, and planned to only have troops in them in the hours leading up to the attack, there were not even enough beds for all of the troops that were huddled inside. So, instead of being able to stay in them for the duration of the delay, most of the troops were forced to march back and forth between the Stollen and their permanent billets every time that the attack was scheduled to kick off. They would reach their billets after a long march in the freezing weather, sleep for a few hours, then march back to the Stollen, again through the cold, then spend most of the day just hanging around or even worse trying to get the water that was accumulating on the floor out of the Stollen. While all of this marching back and forth through the cold took its physical toll on the troops the effect it had on the mentality of the German soldiers was far worse. Getting into a mental state of being ready to attack was difficult enough, then having to do that over and over again over the course of two weeks was almost impossible. The constantly waiting dulled the enthusiasm and lowered the morale of the troops. Unfortunately the discomfort of the German troops was not the worst consequence of the delay, on a strategic level the French spent the delay increasing their readiness for the attack almost every day. We will talk more about the French preparations next episodes, but suffice to say that many historians believe that if the German attack had went forward on schedule the history of the Battle of Verdun would have been very different. The Germans had tried their best to keep the preparations for Verdun secret from the French. Part of this was done at Verdun, like making sure that the Germans always had control of the air over the battlefield. We will dig into the German air armada next week, however that was not the only focus of the German plans to prevent the French from concentrating on Verdun. Much of this took place at an army level and above, designed to make the French high command believe that the main attack was happening somewhere, anywhere, else. All along the line from the coast to Switzerland there were armies involved in confusing the French and British. The attack on Belfort continued to be planned, and the Crown Prince even toured the line near the planned attack area. When he did this tour it was in perhaps the least secretive way possible. The preparations here at Belfort would continue right up until and after the attack at Verdun started. The 4th army prepared to launch an attack near Ypres, the 6th and third Armies prepared for attack on their fronts. Some of these attacks were even launched on a small scale as diversions. The 5th army did none of this, focused instead of doing its best to keep local preparations as secretive as possible. The preparations were of course completed at night. Falkenhayn also went to great lengths at the General Staff level to keep the operations secretive. He did not tell other German leaders like Bethmann-Hollweg of his intentions until close to the time of the attack and the overall number of people involved in planning was kept to an absolute minimum. Very few of the planning discussions were even written down, Falkenhayn insisting on face to face conversations for much of the large decision making. German Strategy and the Path to Verdun by Robert Foley has this to say about the consequences of this policy. "This secrecy had two significant consequences. First, it made it extremely difficult for Falkenhayn's subordinates to understand properly the General Staff Chief's strategic and operational ideas. Falkenhayn merely gave their staffs specific situations from which they were required to submit operational plans." The lack of written material about the planning process for Verdun also making it hard to determine the exact evolution of the plan, and this all ties back of course to the existence, or non-existence, of the Christmas letter that we discussed last episode. Part of the reason historians are so dependent on the letter is because of the lack of other written material detailing the planning for the attack. Unfortunately, even with all of these attempts at deception, and the lengths that Falkenhayn went to before the attack, the French would know that the attack was coming, especially as the delays drug on and on. One of the big problems with creating the podcast that I will never be able to solve is that I, employed full time as a software engineer for my real job, cannot read every great source about the war before I start to write episodes. I just don't have the time, I try to find good complete sources but sometimes I will find one that is just amazing only after I have done many episodes. Because of these reasons it is our source of the week and it is Ring of Steel by Alexander Watson. It is a great book looking at the war, but unlike most English sources it focuses strictly on the events in Germany and Austria-Hungary with large pieces of the book devoted to the changes in the German and Austrian societies during the war. All of that will of course be useful later, I just wish I had read it before releasing the episodes last year. That is all in the past, but for right now I want to focus on a section from Ring of Steel that focuses on how the German and Austrian armies changed in the year and a half of war leading up to 1916. The armies had changed since August 1914, prompting Alistair Horne in The Price of Glory to say "The troops that faced each other at Verdun represented the peak that the war was to produce. Like steel that has been tempered for just the right length of time, they were hard and tensile, but not yet brittle; no longer the green enthusiasts of 1914, nor yet the battle-weary veterans of 1917-1918." The question is, was this statement by Horne accurate from a German perspective? The armies in 1916 were made up of more conscripts than they had been when the war started, this was mostly due to the losses experienced among the ranks of career officers which was the blight of all of the armies in the first year of the war. These men and their experience were essential to turning the raw recruits of the following years into competent soldiers, and there were far too few of them that returned from the killing fields of 1914. Because of this the fighting ability of all of the armies of 1916, on a unit to unit basis, had probably decreased even if the armies as a whole were far better equipped and prepared for warfare. By the beginning of 1916 1 in 6 of German active officers had been killed. That is not wounded, captured, or missing, but confirmed killing. This was felt the hardest in the front line, where not only the casualties were felt but also many officers had been pulled out to take up staff positions in the rear. This was done to try and get at least a skeleton crew of experienced officers for all of the new formations that were being created out of fresh conscripts. The attrition rate also great effected all of the German reserve officers that had their period of active duty in the years before the war. All of these factors came together to mean that in 1916 most German officers in the front lines were "Kriegsoffiziere" or War Officers. While these officers were obviously at an experience disadvantage compared to those that they replaced they also had other issues. There had been a slow increase in hostility between officers and men in the ranks of the German army. Part of this was just the tension between the men at the front and the staff officers behind the lines, but this was fairly typical on all fronts. But there was also enough hate to go around for the junior officers at the front. They were under a lot of stress and were not helped by the fact that the soldiers under their command were older than them and often had far more experience in the war. This was a problem for experience d units at the front but also of reserve formations newly arriving from Germany, were older men were being put under the command of much younger men fresh from officer school. In other armies, like the French army for instance, when there were not enough experienced officers available to make good casualties some of the positions were filled by commissioning non-commissioned officers to take their places. They found it far more effective to promote an experienced NCO and give him new responsibilities instead of trying to train up a new officer. This was not something that was done by the German army during the opening years of the war. There were certain educational requirements that made it very difficult for an NCO to get promoted, and there were also manpower shortages in the NCO ranks to deal with. With so many casualties in all ranks, from top to bottom the men were just less effective. Here is a direct quote from Ring of Steel "The soldiers recruited in wartime were on average less effective than their predecessors for three reasons. First, they were often less fit. To meet urgent manpower needs, the German army had lowered its medical requirements drastically at the end of 1914, drafting even the partially disabled, mentally ill and deaf. Predictably, these proved poor soldiers, and in the spring of 1915 medical entry standards were again raised and a new gradation system dividing men as fit for front, garrison or labour service was introduced. Second, the wartime replacements were often a little too young or too old than was optimal for soldiering. Finally, these new soldiers had passed through only brief military training. In peacetime, drafted men served for two years. In war, recruits in the German army received eight weeks of basic instruction in home camps plus another four in field recruit depots," Now that I have spent so long speaking about doom a gloom for the German army, let me reel it back in real fast. The German army of 1916, even with the problems listed above, was more powerful in 1916 than at any point in the war up to that point. Their equipment and armament was far better, their tactics had hugely improved, they were led by a large by fine officers who really knew their stuff. Discipline and belief in the cause was as strong as ever, morale was high, on the Eastern front they had been victorious, on the Western Front they had stood strong, but everyone who found themselves at Verdun would be tested mightily by what they would soon face. I hope you will join me next week as we finally get around to discussing a bit more about the French preparations for the attack.